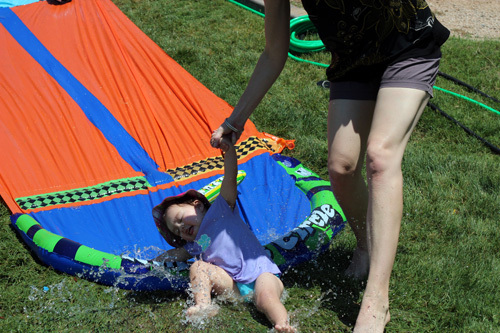 How many times can I post pictures of my family’s summertime activities before you will stop finding my blog entertaining and/or interesting? A) Oh don’t worry, you can do that a bunch more times before I’ll get bored and unsubscribe. It’s fun to read about other people’s vacations and parties! 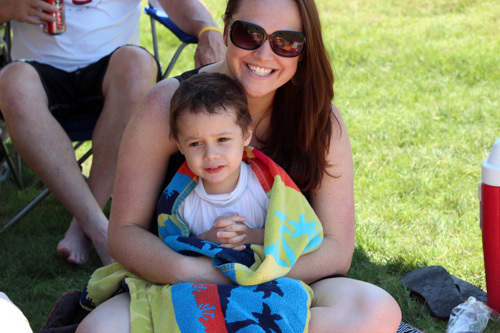 Also, your nephew, Colby, is really adorable. B) You’re going to max me out on the entertainment value of your family in about 3 more posts. Move it along to actual content, sister. C) I was neither amused nor entertained by it the first time you did it. Why would I want to look at pictures of your kids? Who do you think I am, your mother? D) I am your mother, so I think it’s really cute and you should do it more often. E) You can do it as often as you like because no one reads your dumb blog anyway. If you answered C, you should click away right now. Do it. Click away, quick. If you answered E, you’re kind of mean. Why are you reading this anyway? But it’s OK, leave me a mean comment right now and then I’ll feel all super important because I officially have a troll. Anyone who’s anyone in the blogging world has a stranger who leaves mean comments on their blog. If you answered A, B or D, you can probably guess where this is going. My middle son, Dreyber Ever Newin (as christened by his little brother, Jonas) turned 7 last week. This fact makes me feel very very old. It’s one thing that my eldest is almost 11. I can still kind of pretend that I had him when I was a teenager (back before it was cool and could make you famous) and I’m really only in my late 20s. 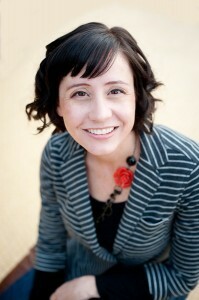 But with my middle son fully ensconced in elementary school and void of all trace of baby, I officially feel elderly. I’m no longer ‘prematurely grey’. I’m just ‘appropriately grey’. I should probably buy a walker. 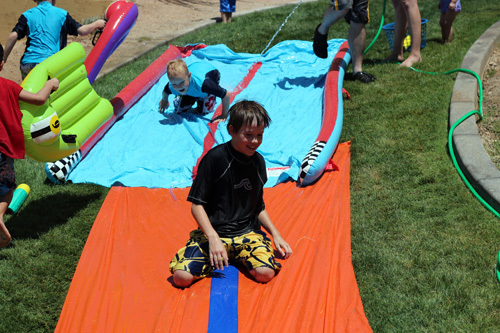 Anyway, we threw him a slip n slide birthday party in the greenbelt behind our house on Saturday. 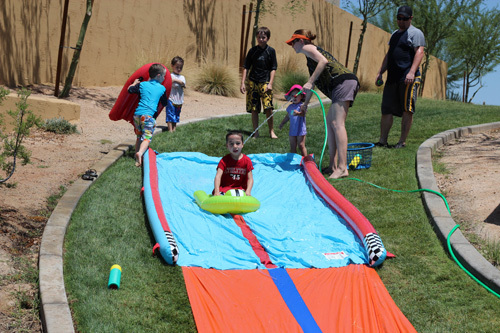 We invited the neighborhood kids and close friends and family to come sit out in the 115 degree heat and celebrate with us. They were all such good sports. The party was totally a success. 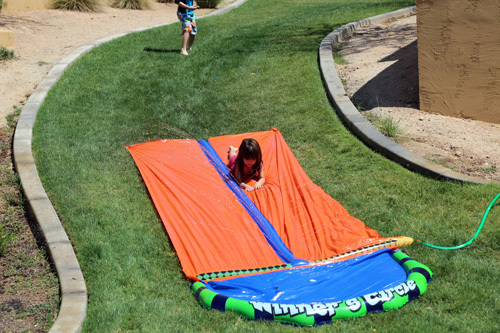 DON’T assume one lame slip n slide will cut it. It won’t. These children aren’t frozen by the fast shutter speed I used to take the photo. 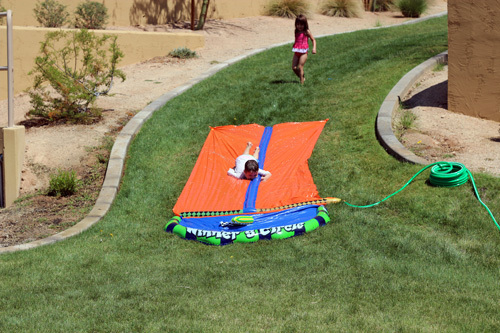 They’re lying stationary in the middle of a lame slip n slide that should really be called ‘Lay and Get Damp’. 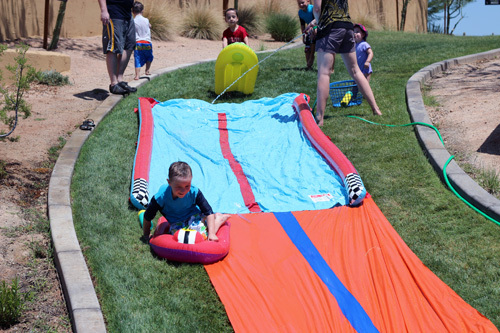 DO have random old slip n slides in the garage that you can dig out at any given moment when the kids start to look like they’re going to bail out of boredom. Two is so much more awesome than one. DO have treats on hand to bribe small children when they fall and injure themselves. Kids are easily bribed. Generally Capri Suns work. 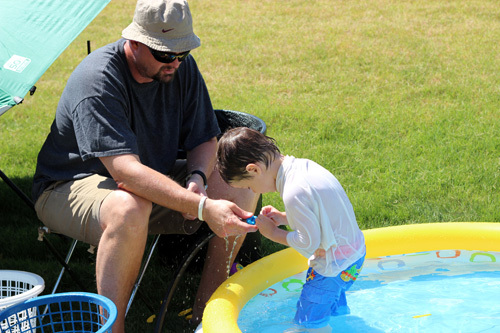 DON’T force the invited adults to sit in the hot sun without adult beverages while the kids have all the fun. Provide them with shade and margarita-like beverages. DO resist the urge to take the neighbor kid who wants to race you up on his offer. 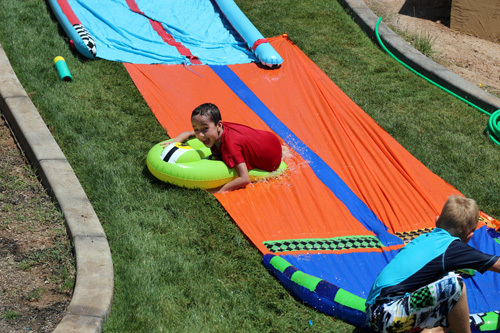 You’re bigger than he is and you’re inevitably going to crash into him and almost knock him unconscious when you get to the bottom of the slip n slide. In front of his parents and the rest of your neighbors. That’s the kid I almost killed. He was having such a good time until then. DON’T let your three year old be in charge of filling the water balloons. Not that you would. That would be stupid. 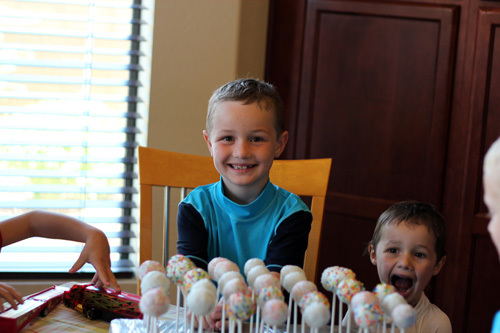 DO make cake pops instead of a cake. Because then everyone will be super impressed with your baking skills (unless they’ve made them before and know they’re really easy and require no skill). When I read “Dreyber Ever Newin” it was so awesome it chased his real name out of my head for a few seconds. The ‘lay and get damp’ made me LOL a lot. GAWD!!!! I’m sweating just looking at these pictures. But it looks like you had a good time – nice going parents. Jeez, Colby IS adorable. Post more photos of him because Sarah doesn’t post nearly enough. I checked A and D, though I’m obviously not your mother, but I am your family and am always sad when we miss out on super fun family get togethers…so I love to see the pics…and Colby IS super adorable, so Sarah maybe you could send along some more pictures stat. You can also add j&j baby soap for faster injuries!!! Looks like fun to me.